Understanding the topics that impact the actuarial industry is vital if you want to pursue a career as an actuary. In this article, James Nicholl from APR explains everything you need to know about IFRS 17.
International Financial Reporting Standard 17 is the new insurance accounting standard published in 2017 by the International Accounting Standards Board (IASB). It is expected to be adopted by most countries worldwide (with the USA and Japan being among the more notable of the exceptions). The standard relates to insurance business of insurance companies that report their profits using IFRS (which is a big majority) in any country that adopts the new standard, and will apply to both existing policies and new business sold. It was due to take effect from 2021 onwards, but in November 2018 the IASB voted to delay implementation for one year, to 1 January 2022. To increase consistency in accounting of insurance business across companies and countries. To increase the transparency of insurance accounts. To match realisation of profits more closely to the underlying insurance business. What are the changes it is delivering? Under IFRS 4 companies can use country-specific approaches, such as UKGAAP or USGAAP (the UK’s and US’s generally accepted accounting principles respectively – these are not the same as each other). As opposed to prudent assumptions that were previously used, and overestimated the reserves that should be held. That is, when the claims cost the insurer more than the reserves they hold for the expected claims. This is the amount of future profit the insurance company expects to make that they have not currently recognised in their accounts. It is recognised gradually over time by releasing an amount every year as profit. Future cash flows – All expected probability-weighted future cashflows – both cash inflows (such as premiums) and outflows (such as claims and expenses). These are estimated using best estimate assumptions of the future. Time value of money – The impact of discounting on the expected future cashflows. Risk Adjustment – An additional liability to allow for uncertainty in the expected future cashflows, both in terms of their size and timing. Contractual Service Margin (CSM) – The unreleased profit. At the point an insurance policy is sold this is the balance required to take the sum of the three liabilities above to zero, provided the sum is negative (a negative liability at sale implies a profitable insurance contract). Note that the CSM itself can never be negative. 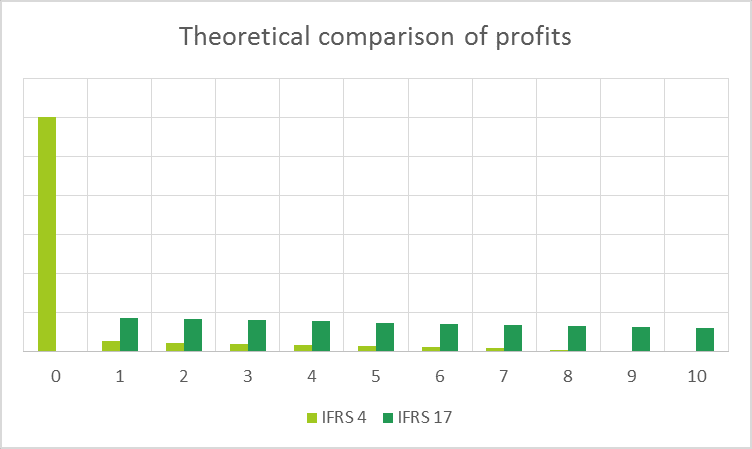 Calculating profit under IFRS 17? Interest on assets (held as reserves). Reserves released less any claims or expenses paid. Release of the risk adjustment. There are other profit sources but these are the key items, which we’ll now explain in a little more detail. Interest on assets is a company’s investment return. For a lot of insurance companies, a large proportion of their assets will be held in reserves, so depending on the types of product they are reserving for they may be holding relatively safe assets with low rates of return. Reserves released less any claims or expenses paid is essentially the difference between what an insurance company thinks they will need to pay out and what they actually pay out in practice. If a company’s best estimate assumption is 100% accurate this will be zero, as they will hold exactly the amount of reserves needed to pay their claims and expenses. In practice this doesn’t happen, but instead actual claims and expenses will be higher or lower leading to losses or profits respectively. Release of risk adjustment is an amount the insurer will expect to release as profit in normal circumstances. The risk adjustment is held for claims differing from what is expected, so should only be needed to be used to cover claims when they are higher than was expected. If this is not the case then the amount of risk adjustment being held for that period can be released as profit. Release of CSM is likely to be the profit source that will be most heavily scrutinised under IFRS 17. As the CSM is, in effect, a liability that represents the unreleased profit, this is understandable. The CSM, once it is set up as above, will be released over the life of the insurance policy such that insurance companies would expect to see profits coming from this in each valuation period. This is very different from IFRS 4 where any profit calculated at the start of a contract would have been released immediately, and then the remainder, mainly resulting from having used prudent assumptions, would have come out over time. The latter aspect could potentially be subject to a fair degree of volatility, and so the expectation is unlikely to have been as clear cut as with the CSM, which will be released smoothly over time in a predictable pattern. IFRS 17 is still a new standard (very new by insurance standards), and the industry is still in the process of interpreting some aspects. IFRS 17 requires a large amount of historical data as, initially, contracts will need to be valued as if they have been valued under IFRS 17 since they were written. For some old polices that are on legacy systems there are significant data holes or issues the further back you go in time. IFRS 17 is quite a fundamental change with relatively tight implementation deadlines. As a result, several European insurance bodies (including the UK’s own ABI) have been lobbying for a delay in the adoption of IFRS 17 owing to some of the above points, which has at least in part led to the deferment to the implementation deadline. However, even with this deferment, 2022 is only three years away now, which is not very long in insurance development time; the various issues and concerns raised have also added some uncertainty as insurers prepare for implementation. What impact does it have on actuaries? IFRS 17 is going to have quite an impact on actuaries. The obvious initial impact will be the need to update reserving models to include the two new liability concepts included in IFRS 17 – risk adjustment and contract service margin. For both there will be a number of methodology decisions to make, as well as a significant amount of model development and testing. IFRS 17 will also require changes to data and reporting processes, which will lead to significant development work over the next couple of years. Longer term, IFRS 17 will also mean that actuaries are a lot more involved in reporting of profits. Traditionally actuaries would calculate the reserves and communicate these to accountants along with the explanations on why they had changed; this was often where their involvement ended. Under IFRS 17 actuaries will now also need to communicate changes to, and the release of, the CSM, which will be a significant part of the reported profit. As this will be wholly owned by actuaries they will need to get a lot more involved in the profit reporting process to explain this portion of the profits (or losses!). Actually, this is not always strictly true. It is the case on insurance contracts that the insurer sells but it is not true on the reinsurance they may take out on these contracts. James Nicholl is a Senior Actuarial Associate at APR LLP. James joined APR in 2012 after graduating from LSE and became a fellow of the IFoA in 2017. As well as working with clients on a range of projects, James is APR’s technical lead on IFRS 17. More details on IFRS 17 can be found in APR’s series of News & View articles which can be found here.